Corben Sport Planes Museum is located in the scenic foothills of the Appalachian Mountains in northeast Georgia at the Toccoa-Stephens County Airport (KTOC) in the historic R. G. LeTourneau hanger off of Runway 9 - 27. We are just a short cross country flight from many airports in Georgia, South Carolina, North Carolina, and Tennessee. THIS INFORMATION IS NOT TO BE USED FOR NAVIGATION OR FLIGHT PLANNING PURPOSES! ALWAYS refer to the most current aeronautical data approved for flight planning and navigational use. 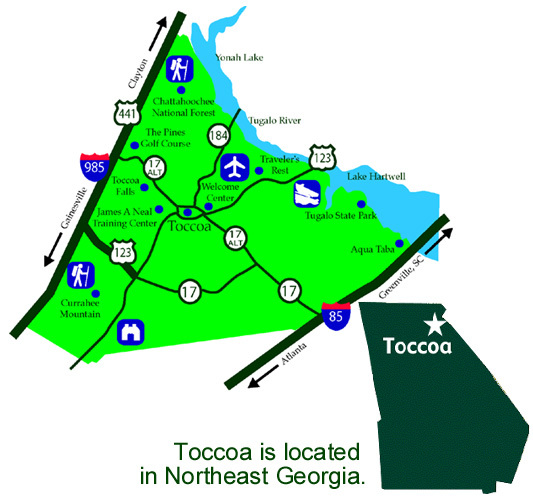 The City of Toccoa and Stephens County are located in the scenic foothills of the Appalachian Mountains in northeast Georgia. Toccoa and Stephens County offer visitors a diverse range of activities and attractions-from historic sites to tour to mountain and lake activities to shopping and dining. So, hop in your aircraft and fly on in. We'll be looking forward to your visit.